The wlanTGacChannel System object™ filters an input signal through an 802.11ac™ (TGac) multipath fading channel. The fading processing assumes the same parameters for all NT-by-NR links of the TGac channel, where NT is the number of transmit antennas and NR is the number of receive antennas. Each link comprises all multipaths for that link. Create the wlanTGacChannel object and set its properties. tgac = wlanTGacChannel creates a TGac fading channel System object, tgac. This object filters a real or complex input signal through the TGac channel to obtain the channel-impaired signal. tgac = wlanTGacChannel(Name,Value) creates a TGac channel object, tgac, and sets properties using one or more name-value pairs. Enclose each property name in quotes. For example, wlanTGacChannel('NumReceiveAntennas',2,'SampleRate',10e6) creates a TGac channel with two receive antennas and a 10 MHz sample rate. Sample rate of the input signal in Hz, specified as a real positive scalar. Delay profile model, specified as 'Model-A', 'Model-B', 'Model-C', 'Model-D', 'Model-E', or 'Model-F'. To enable the FluorescentEffect property, select either 'Model-D' or 'Model-E'. The table summarizes the models properties before the bandwidth reduction factor. The number of clusters represents the number of independently modeled propagation paths. Channel bandwidth, specified as 'CBW20', 'CBW40', 'CBW80', or 'CBW160'. The default is 'CBW80', which corresponds to an 80 MHz channel bandwidth. RF carrier frequency in Hz, specified as a real positive scalar. Speed of the scatterers in km/h, specified as a real positive scalar. Distance between the transmitter and receiver in meters, specified as a real positive scalar. TransmitReceiveDistance is used to compute the path loss, and to determine whether the channel has a line of sight (LOS) or non line of sight (NLOS) condition. The path loss and standard deviation of shadow fading loss depend on the separation between the transmitter and the receiver. Normalize path gains, specified as true or false. To normalize the fading processes such that the total power of the path gains, averaged over time, is 0 dB, set this property to true (default). When you set this property to false, the path gains are not normalized. User index, specified as a nonnegative integer. UserIndex specifies the single user or a particular user in a multi-user scenario. Transmission direction of the active link, specified as either 'Downlink' or 'Uplink'. Number of transmit antennas, specified as a positive integer from 1 to 8. Distance between transmit antenna elements, specified as a real positive scalar expressed in wavelengths. TransmitAntennaSpacing supports uniform linear arrays only. This property applies only when NumTransmitAntennas is greater than 1. Number of receive antennas, specified as a positive integer from 1 to 8. Distance between receive antenna elements, specified as a real positive scalar expressed in wavelengths. ReceiveAntennaSpacing supports uniform linear arrays only. This property applies only when NumReceiveAntennas is greater than 1. Large-scale fading effects applied in the channel, specified as 'None', 'Pathloss', 'Shadowing', or 'Pathloss and shadowing'. Fluorescent effect, specified as true or false. To include Doppler effects from fluorescent lighting, set this property to true. The FluorescentEffect property applies only when DelayProfile is 'Model-D' or 'Model-E'. Power line frequency in Hz, specified as '50Hz' or '60Hz'. The power line frequency is 60 Hz in the United States and 50 Hz in Europe. This property applies only when you set FluorescentEffect to true and DelayProfile to 'Model-D' or 'Model-E'. Normalize channel outputs by the number of receive antennas, specified as a true or false. If you set RandomStream to 'Global stream', the current global random number stream generates normally distributed random numbers. In this case, the reset function resets the filters only. If you set RandomStream to 'mt19937ar with seed', the mt19937ar algorithm generates normally distributed random numbers. In this case, the reset function also reinitializes the random number stream to the value of the Seed property. Initial seed of an mt19937ar random number stream, specified as a nonnegative integer. The Seed property reinitializes the mt19937ar random number stream in the reset function. This property applies only when you set the RandomStream property to 'mt19937ar with seed'. Enable path gain output computation, specified as true or false. y = tgac(x) filters input signal x through the TGac fading channel defined by the wlanTGacChannel System object, tgac, and returns the result in y. [y,pathGains] = tgac(x) also returns in pathGains the TGac channel path gains of the underlying fading process. This syntax applies when you set the PathGainsOutputPort property to true. NS is the number of samples. NT is the number of transmit antennas and must be equal to the NumTransmitAntennas property value. NR is the number of receive antennas and is equal to the NumReceiveAntennas property value. NP is the number of resolvable paths, that is, the number of paths defined for the case specified by the DelayProfile property. NT is the number of transmit antennas and is equal to the NumTransmitAntennas property value. reset: If the RandomStream property of the System object is set to 'Global stream', the reset function resets the filters only. If you set RandomStream to 'mt19937ar with seed', the reset function also reinitializes the random number stream to the value of the Seed property. Generate a VHT waveform and pass it through a TGac SISO channel. Display the spectrum of the resultant signal. Set the channel bandwidth and the corresponding sample rate. Create a TGac SISO channel with path loss and shadowing enabled. Pass the VHT waveform through the channel. Plot the spectrum of the received waveform. Because path loss and shadowing are enabled, the mean received power across the spectrum is approximately -60 dBm. Create a VHT waveform having four transmit antennas and two space-time streams. Create a 4x2 MIMO TGac channel and disable large-scale fading effects. Pass the transmit waveform through the channel. Display the spectrum of the two received space-time streams. 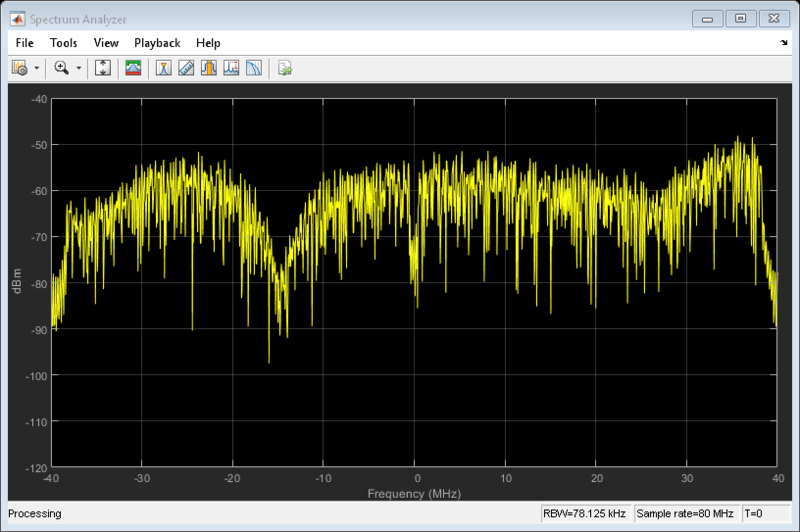 Transmit a VHT-LTF and a VHT data field through a noisy 2x2 MIMO channel. Demodulate the received VHT-LTF to estimate the channel coefficients. Recover the VHT data and determine the number of bit errors. Set the channel bandwidth and corresponding sample rate. Create VHT-LTF and VHT data fields having two transmit antennas and two space-time streams. Create a 2x2 MIMO TGac channel. Create an AWGN channel noise, setting SNR = 15 dB. Pass the signals through the TGac channel and noise models. 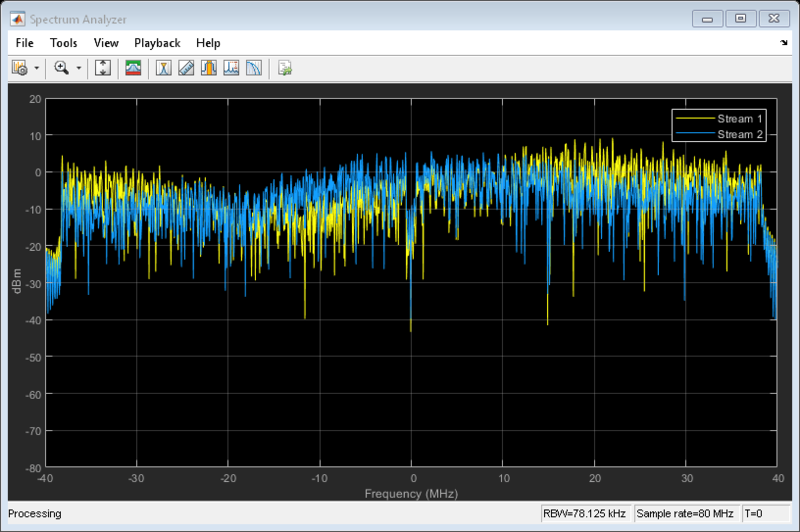 Create an AWGN channel for a 160 MHz channel with a 9 dB noise figure. The noise variance, nVar, is equal to kTBF, where k is Boltzmann's constant, T is the ambient temperature of 290 K, B is the bandwidth (sample rate), and F is the receiver noise figure. Pass the signals through the receiver noise model. Demodulate the VHT-LTF. Use the demodulated signal to estimate the channel coefficients. Recover the data and determine the number of bit errors. Complete information on the changes required to support TGac channels can be found in . TGac channels support bandwidths of up to 1.28 GHz, whereas TGn channels have a maximum bandwidth of 40 MHz. By increasing the sampling rate and decreasing the tap spacing of the power delay profile (PDP), the TGn model is used as the basis for TGac. The channel sampling rate is increased by a factor of 2⌈log2(W/40)⌉, where W is the bandwidth. The PDP tap spacing is reduced by the same factor. The TGn channel model supports no more than 4x4 MIMO, while the TGac model supports 8x8 MIMO. The TGac model also includes support for multiple users while simultaneous communication takes place between access points and user stations. Accordingly, the TGac model extends the concept of cluster angles of arrival and departure to account for point-to-multipoint transmission. For more details, see . Indoor channel measurements indicate that the magnitude of Doppler assumed in the TGn channel model is too high for stationary users. As such, the TGac channel model uses a reduced environment velocity of 0.089 km/hr. This model assumes a coherence time of 800 ms or, equivalently, an RMS Doppler spread of 0.4 Hz for a 5 GHz carrier frequency. Erceg, V., L. Schumacher, P. Kyritsi, et al. TGn Channel Models. Version 4. IEEE 802.11-03/940r4, May 2004. Breit, G., H. Sampath, S. Vermani, et al.TGac Channel Model Addendum. Version 12. IEEE 802.11-09/0308r12, March 2010. Kermoal, J. P., L. Schumacher, K. I. Pedersen, P. E. Mogensen, and F. Frederiksen. “A Stochastic MIMO Radio Channel Model with Experimental Validation”. IEEE Journal on Selected Areas in Communications. Vol. 20, No. 6, August 2002, pp. 1211–1226.